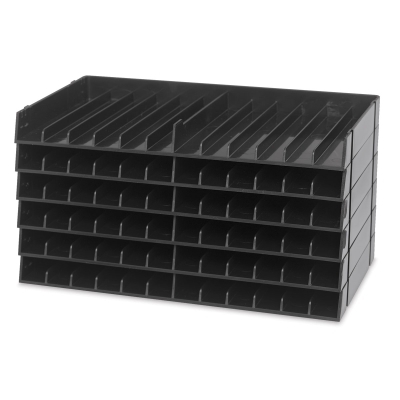 A versatile marker storage solution, Spectrum Noir Marker Trays can be used to store any brand of marker (up to 5/8" Dia). However, they are especially useful for horizontal storage to ensure even ink flow to both ends of double-ended markers. Each unit in the six-tray set holds 12 markers — the perfect size to hold two full packs of color-themed Spectrum Noir markers. Combined, the trays hold a total of 72 markers. 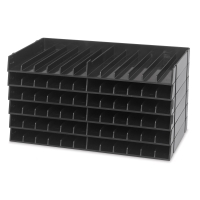 Each tray measures 5-1/4" × 9-1/2" (13.5 cm × 24 cm). 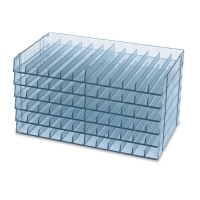 Available in Black or Clear, the trays come as a single boxed unit. The modular system can be customized to suit your space, and used horizontally, vertically, or angled. Portable and lightweight, it has a stylish design that complements any creative space.